It’s been 5 years since I started this blog. So I thought I’d take a look back at my first post and see how times have changed. 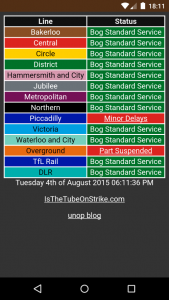 The inaugural article was about a mobile optimised London Underground (tube) status page I created. It’s still available at unop.uk/tube although it has changed a bit. The latest source code is on GitHub. You can see the progression in these captures. When I originally made this there was no API for the Transport for London (TfL) data. However, there was a third party API which scraped their site, now retired. 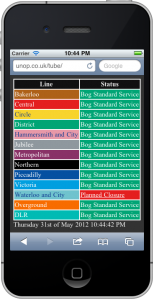 I’ve upgraded it over the years to use the TfL XML API. Even that now is deprecated and they have a better JSON API which even has cross origin headers. The motivation was to make a super small page which would quickly load over a slow data connection on a phone. I kept the HTML very simple and embedded the CSS. It was also a chance to learn about Extensible Stylesheet Language Transformations (XSLT). A way of transforming XML to HTML. It’s a technology I would definitely avoid these days.